Haven’t had time to finish your Christmas decorating? Don’t panic! 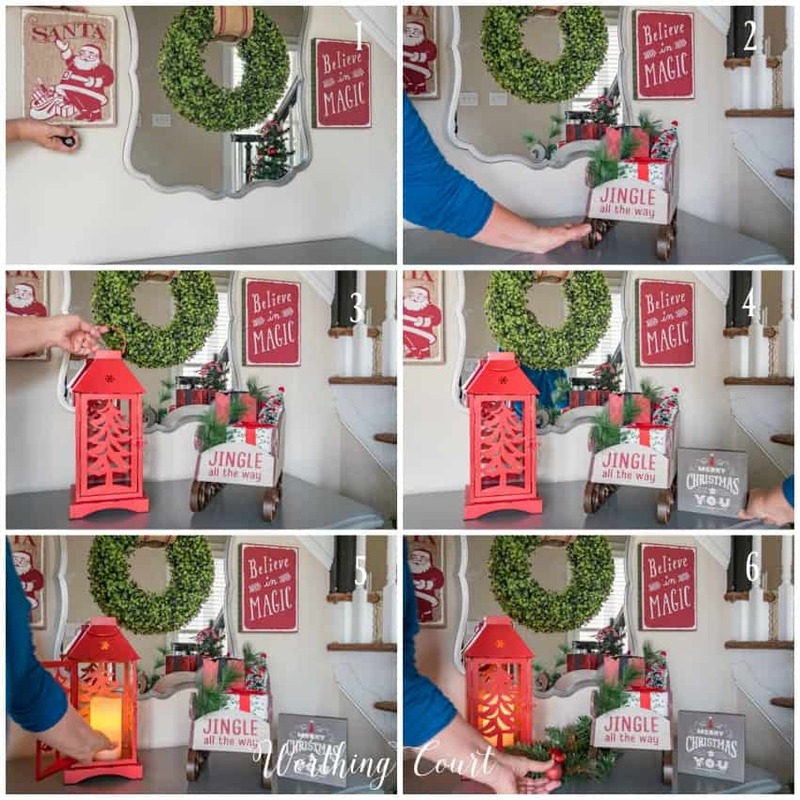 There’s plenty of time to get it done using these fast and easy ideas for adding Christmas all throughout your home. I know firsthand what’s it’s like to feel the pressure to “get it all done” and how impossible it may seem. 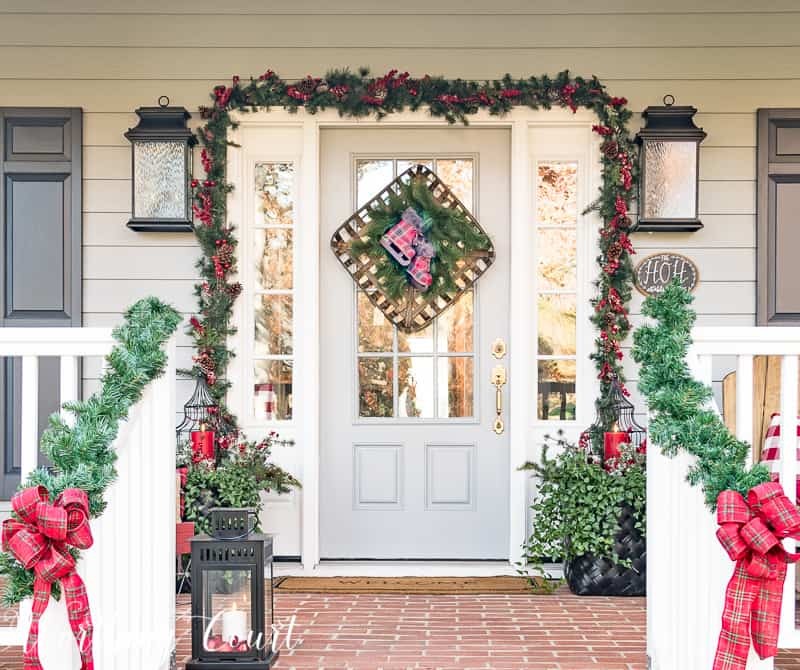 Don’t fret or worry though – if your home is still looking a little Christmas-bare, these super fast and easy decorating ideas will have your home singing “It’s Beginning To Look A Lot Like Christmas” in no time at all! 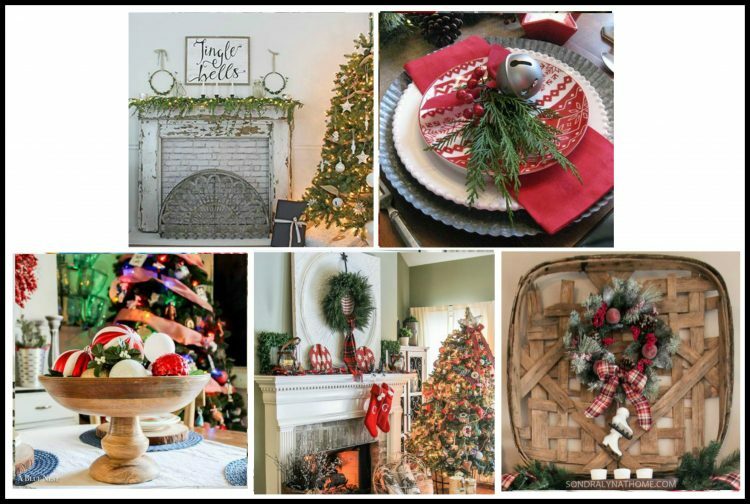 I’m happy to be joining a whole group of talented bloggers for the ‘Tis The Season bloghop, hosted by Barb Garrett from The Everyday Home, where we’re all sharing our last minute Christmas decorating ideas. The list of all of the bloggers who are participating can be found down at the bottom. If you’re joining me from The Chelsea Project, then welcome! Susie’s home is just lovely. I’m especially in love with her Dining Room Makeover! 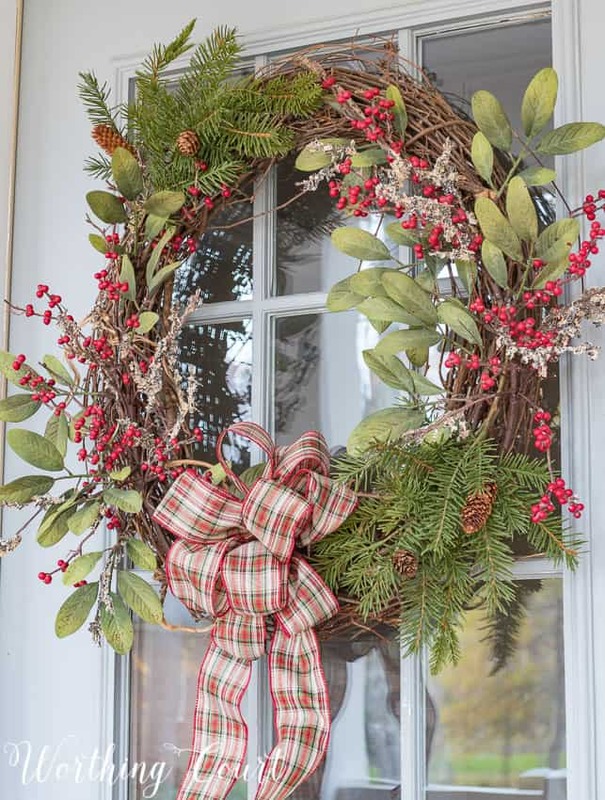 The first thing you probably think of is to place a wreath on your front door. I love being able to make a wreath instead of purchasing a ready made one, since I can usually take the wreath apart after Christmas and reuse the “naked” wreath another time. BUT – I don’t have time for anything complicated! Grapevine wreaths are perfect for making your own wreath. They’re very inexpensive and are easy to work with. Oftentimes, I can just poke Christmas’y picks in between the vines of the wreath and don’t have to wire or glue anything in place. That’s exactly what I did with this wreath. I only needed two of two different types of Christmas bushes/picks and a diy bow for this pretty wreath. The bow is held in place with floral wire, but the sprays are simply poked into the vines. This “wreath” couldn’t be any faster or easier to put together. Tobacco basket + two evergreen sprays + one cute Christmas decoration = done! Everything is held together with jute twine. Both of these porches are from two different Christmases, but you can see some similarities that make my decorating much faster and easier. 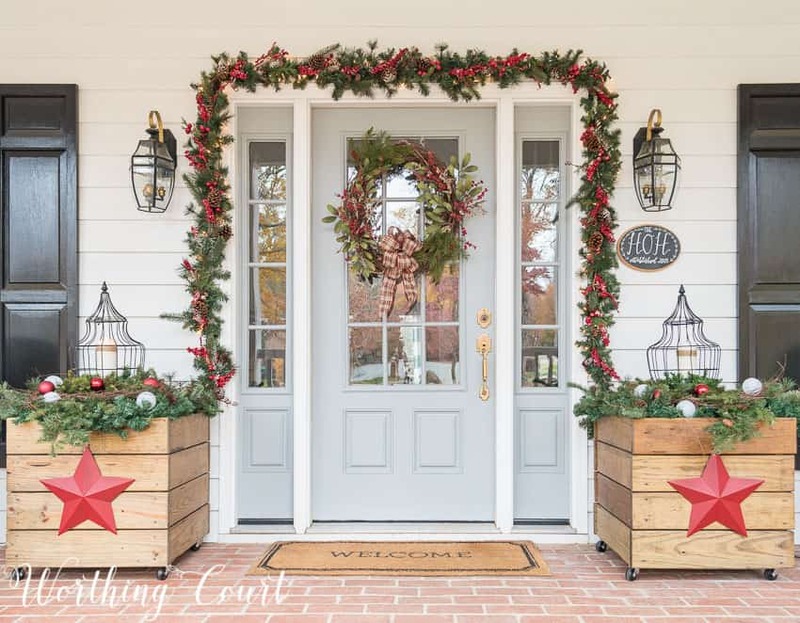 I reused the same garland around my front door, my door is flanked by containers and I’ve used the same lanterns, even though the containers themselves are different. I’m a huge proponent of K-I-S-S decorating. Click HERE if you don’t know what I’m referring to. 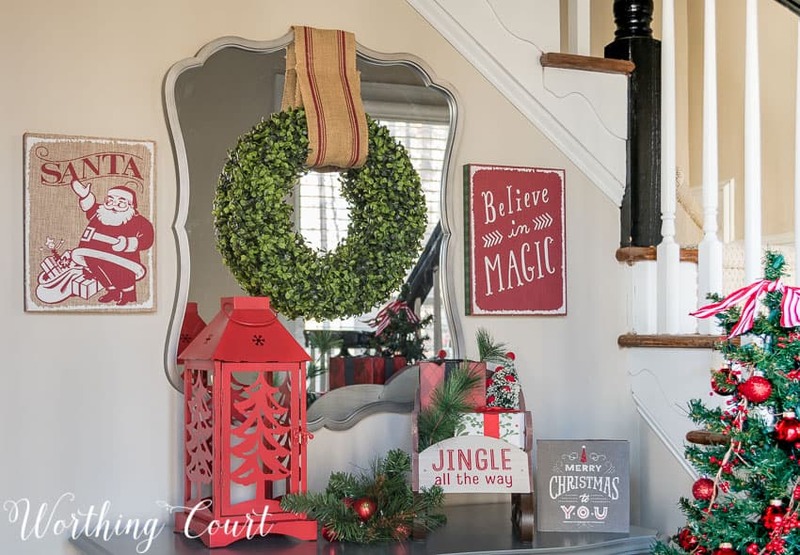 Even if you don’t have a full blown foyer, you can still add simple touches to welcome your family and guests. 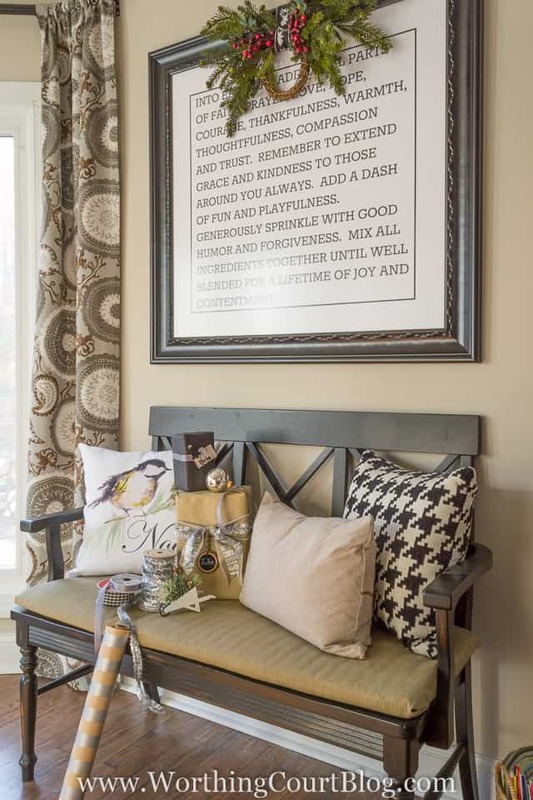 If you don’t have room near your front door for a small chest or table, locate a vignette where it will be visible as soon as your guests enter your home. Something that can be seen from the front door, even if it isn’t right at the front door. 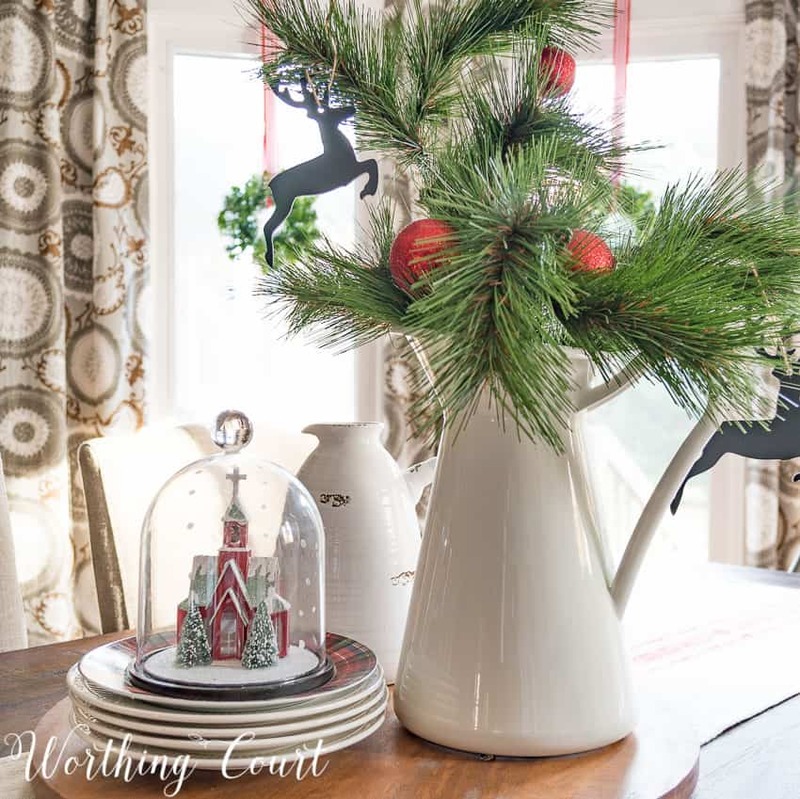 If you do have a small table or chest, look how fast you can add Christmas decorations to it. You can do the same thing on a tabletop elsewhere in your home too! Coffee tables are probably one of the spots most often decorated in our living spaces. To be honest, I almost always struggle with mine. It seems like everything I do is either too small, too tall or too disjointed. This is the first year that I can say I’m completely happy with what I did and it was the easiest thing ever! 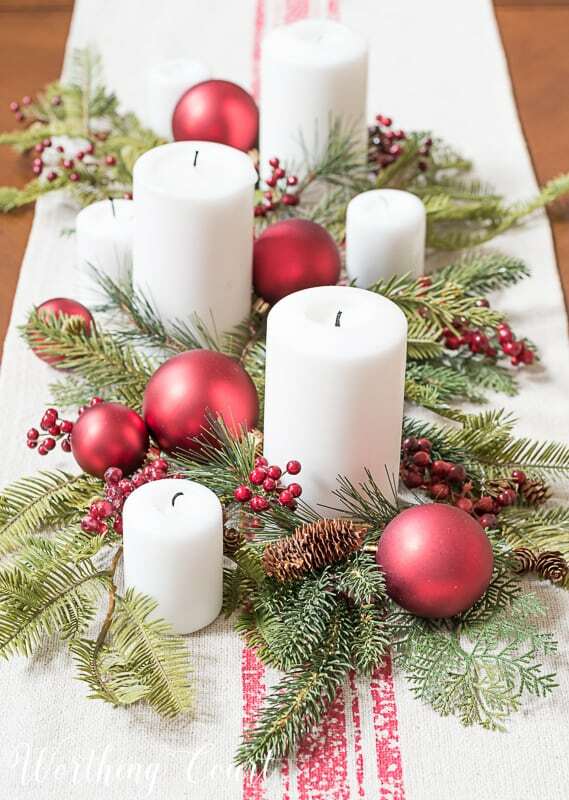 Formula: table runner + multiple sized white candles + faux greenery sprigs + small and large Christmas tree ornaments. Like I said, sooo easy and I love it. My kitchen always becomes a real workhorse during the holidays. Lots of memories are made there! 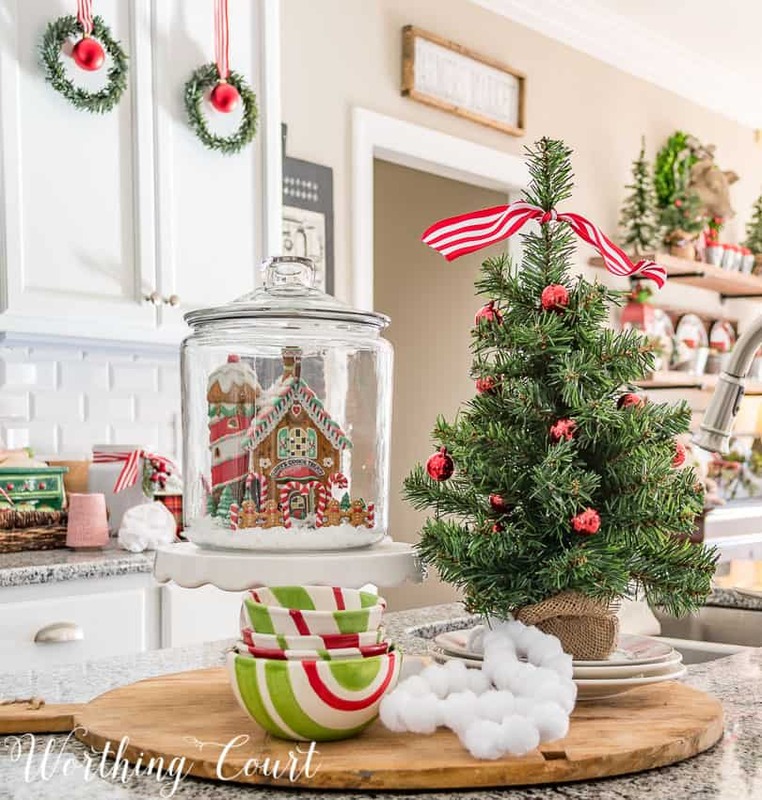 So, while I want my kitchen to be festive for Christmas, I also want to make sure that I don’t clutter the counters with too much stuff that’s difficult to move if I need to. 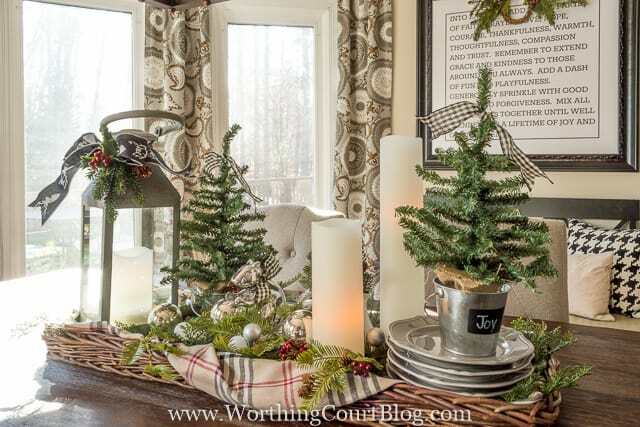 Boxes or trays become great spots for corralling a variety of Christmas’y items without taking up much space. 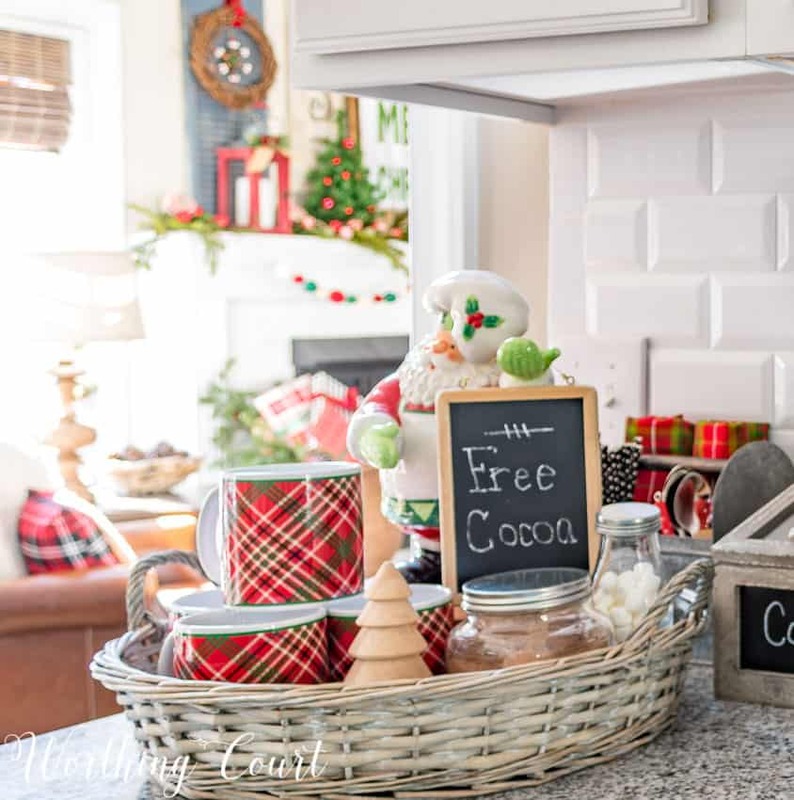 A basket becomes an easy-to-move way to contain everything you need for a hot chocolate station. 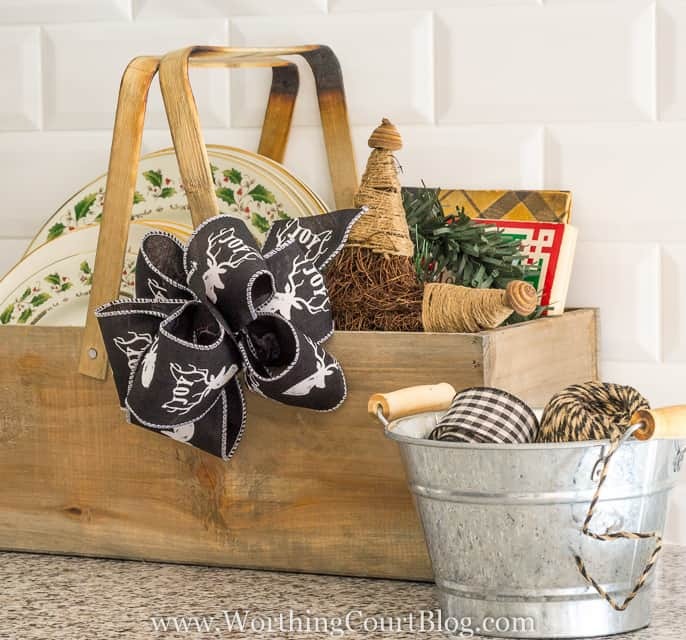 If you have a kitchen island that you like to decorate, using a cutting board for the base of a vignette makes it easy to move things out of the way when the space is needed for food prep or cleanup. 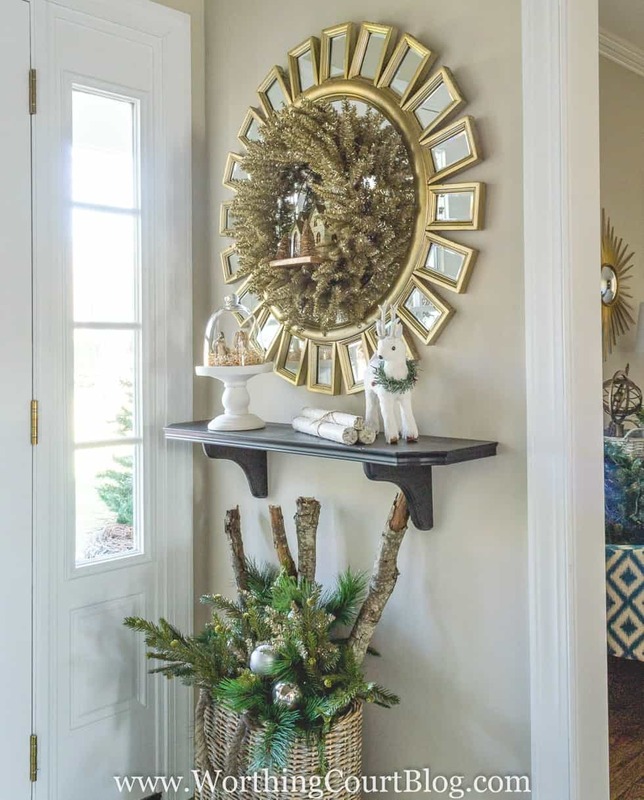 Just like a wreath is probably the first think you think of for your front door, I bet that a centerpiece is the first thing that you think of for the table in your dining area. Once again, no need to spend a lot of time putting together something complicated. 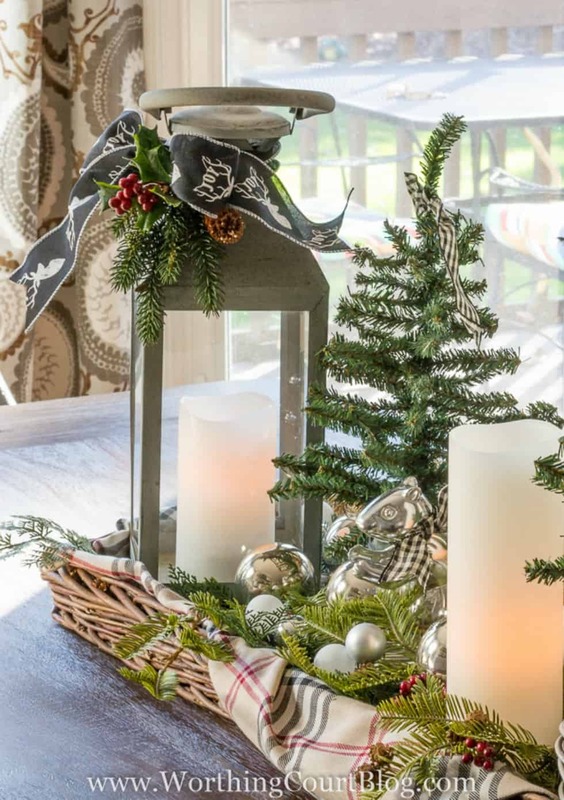 This centerpiece may look like it took a lot of time to create, but here’s the less than 10 minute formula: tray + scarf in the bottom + lantern to anchor one end + fake mini trees + one more cute thing + a stake of plates + candles + fake greenery sprigs + Christmas tree ornaments = a fabulous looking centerpiece! Here’s a centerpiece that’s even easier. Once again, I’ve used a breadboard for the base and added a pitcher filled with fake greenery, another empty container of the same color and a stack of plates topped by a cute Christmas decoration. 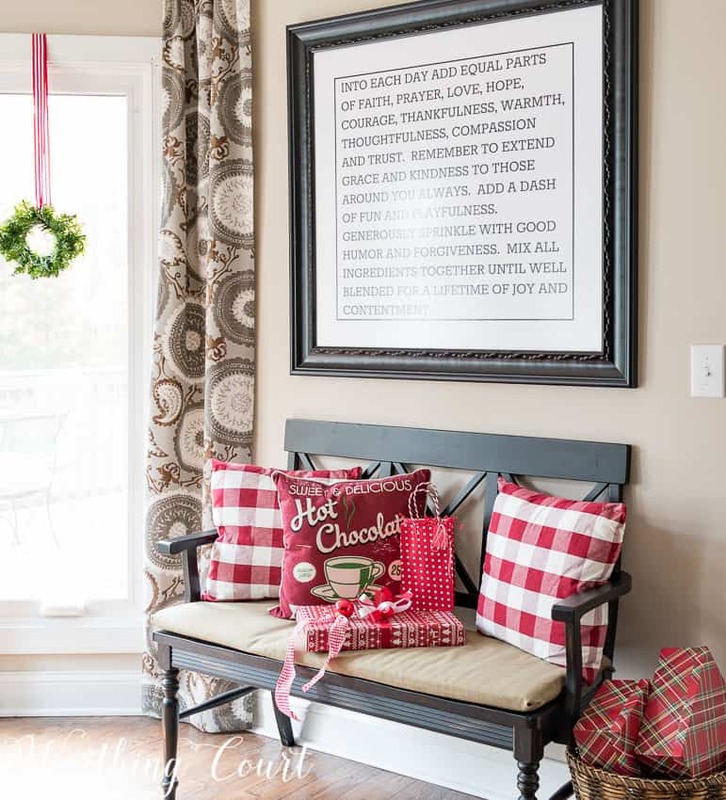 Benches are a perfect spot to add Christmas pillows. Stack a few presents on it too! 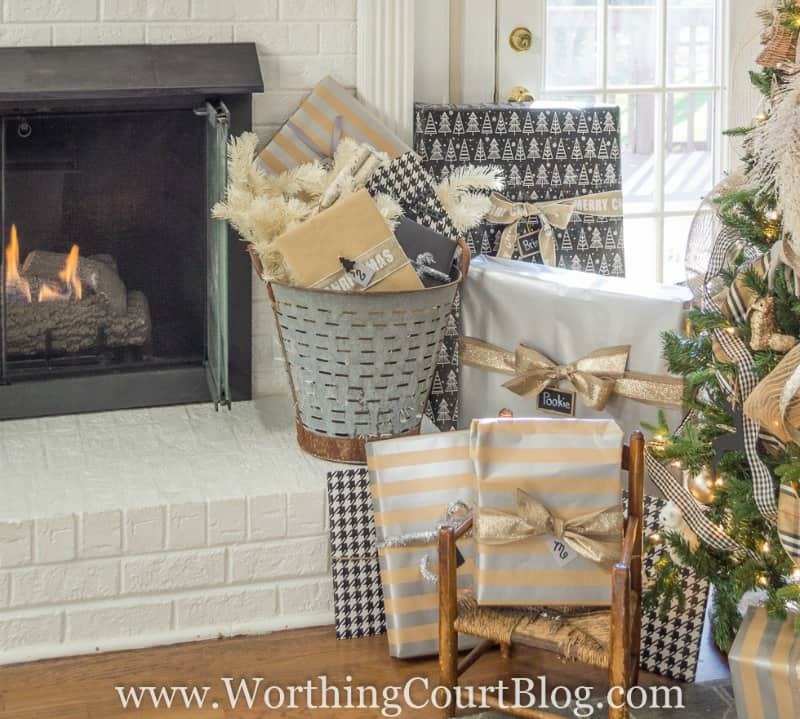 Fill a basket with cheery, festive gifts. 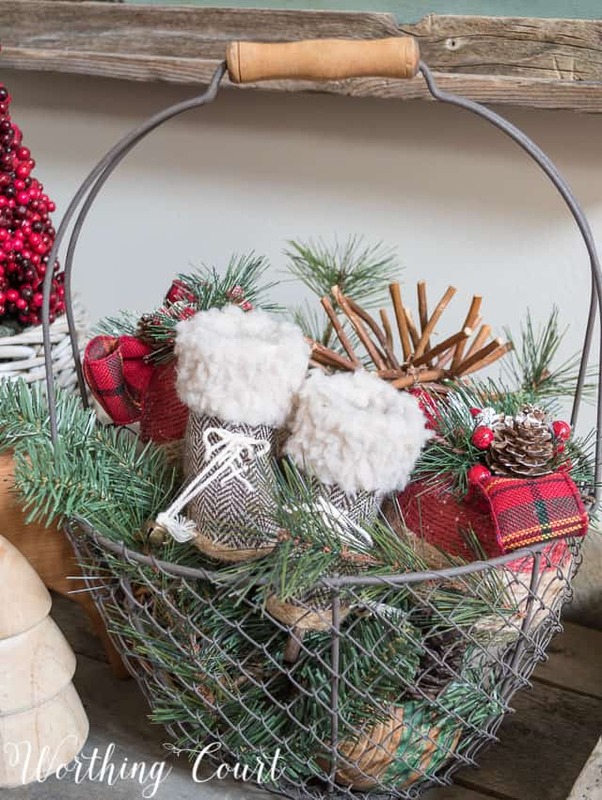 Small wire baskets are great for filling with Christmas goodies and can be tucked in just about anywhere! Don’t forget that the presents under your tree act as decorations too! 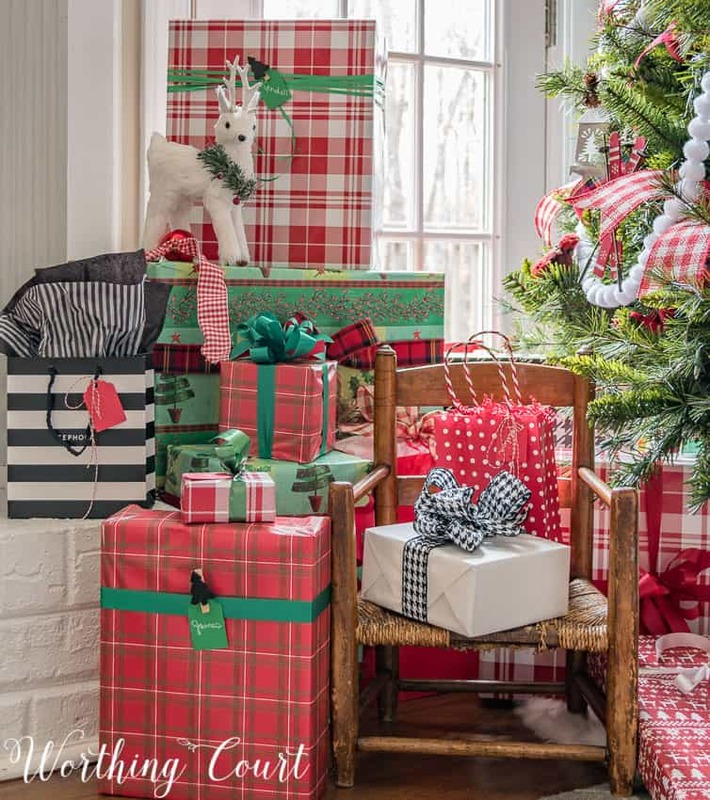 Try to coordinate your wrapping paper and trimmings with what is on your tree. I certainly hope that you’ve found some of these tips helpful! 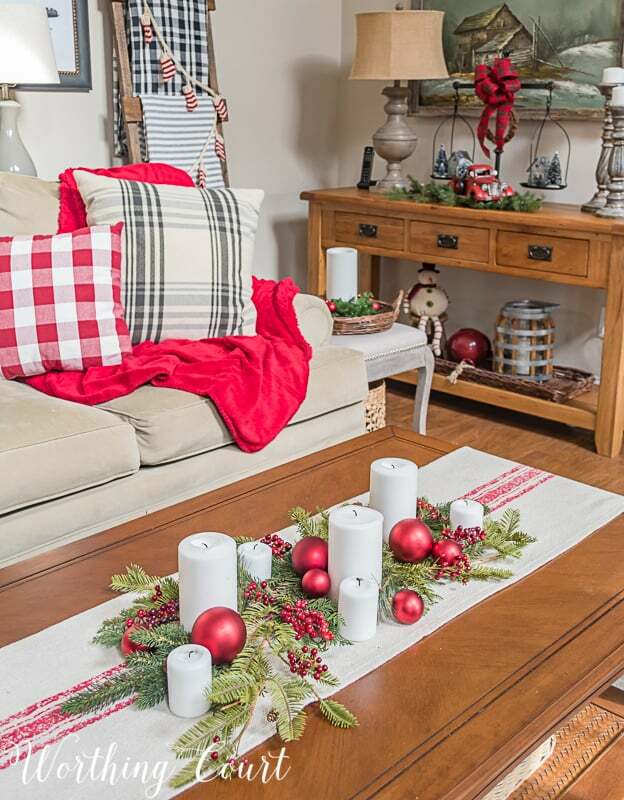 Next up is Debbie’s house from Refresh Restyle. Her home is always just beautiful! Make sure to visit the other amazing blogs too! Suzy, what great information you have given us here. You make it all seem so easy and your results a simply gorgeous! 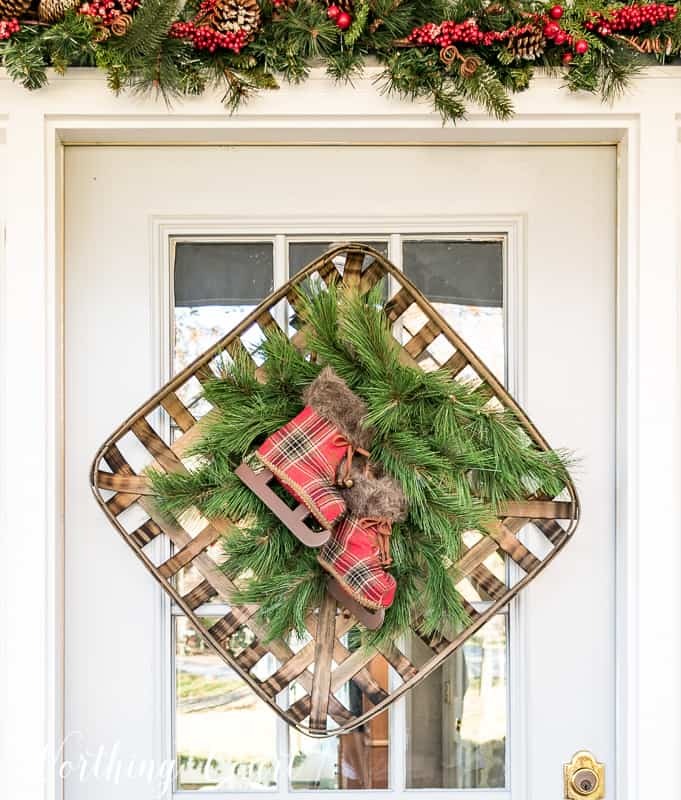 I think your dining room centerpiece is my favorite but I also love the simple grapevine wreath on your front door. Wishing you a very Merry Christmas and a Happy and Healthy New Year! Thanks Susie for all the adorable ideas! The way you pulled things together for your coffee table decor was just exactly the inspiration I was hoping to find! Love the joyful feel of your home! I just want to thank you for all your wonderful decorating ideas & recipes. It make thinks a little less stressful. I really enjoy reading your posts. Thank & have a wonder holiday. So, So Merry!!! You are great!!! Your home looks just beautiful! I enjoy seeing your ideas and thank you for bringing them to all of us!! Oh, girl, won’t you please just hop in your car and come on over to Durham? It’s not very far, you know. . . . Your house looks absolutely amazing! Thank you for arranging so much into this post–there are so many good ideas here, it boggles the mind! Pinning to my Christmas board right now! You have given me a great ideas for every room, especially the kitchen where I spend most of my time. Your home is beautifully decorated with attention to every detail that makes a guest feel warm and welcome. It is a pleasure to share this blog tour with you and thanks so much for sharing your beautiful home. Oh Suzy, I love it all! I’m a little behind but I just have to get my wreath together and I will be done! Such great tips! Thanks for the inspiration! Suzy, so simple but very festive,. I can’t imagine Christmas time without red, I think of colorful cardinals during the winter always brightens what seems so dreary during the winter months. I love the simple ness of live greenery, so elegant! Beautiful, as always. Merry Christmas to you and yours! 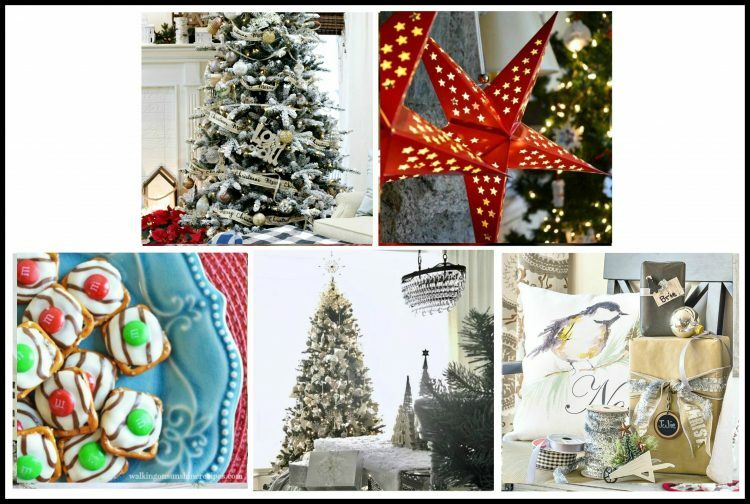 Your home is always beautiful, but I love the Christmas decor! Everything looks so cheerful! I love visiting your blog to be inspired and rejuvenated. 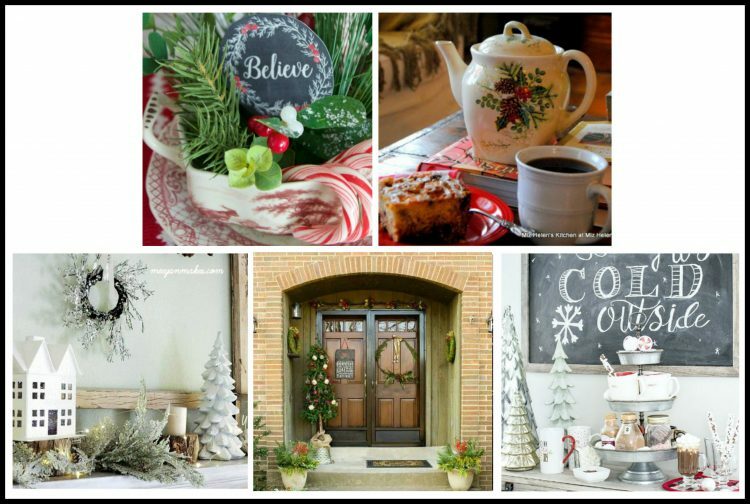 Thank you for sharing so many simple ways to decorate for Christmas. Sometimes I make it too complicated. I definitely need to apply your KISS method. Thanks so much for sharing your lovely Christmas home. Your tips are so great! I especially love your tobacco basket “wreath”! I might snag one the next time I’m at Hobby Lobby now! Your decorating is beautiful! Very homey, not too fancy. I love your “Into each day…” print. My son and daughter-in-law just moved and I would love to give them this print for a house-warming gift. Could you please tell me where you purchased it? Everything looks beautiful, Suzy. I love all of your holiday decor too. Merry Christmas to you and yours. Everything looks stunning! This gives me great inspiration for next year.